San Carlos Lexus Repair & Service - A+ Japanese Auto Repair, Inc.
Where should I take my Lexus for auto repair & service in the San Francisco Bay Area? A+ Japanese Auto Repair Inc. specializes on auto repair & service on all Lexus vehicles. The most common repairs and services we perform on Lexus vehicles are listed below. Beyond these services A+ Japanese Auto Repair Inc. has the ability to perform any auto repair & service on your Lexus vehicle that the Lexus dealership would, using the highest quality parts and providing a 2 year 24,000 mile warranty on any service or repair. Please contact our facility with any questions regarding a specific repair or concern with your Lexus vehicle. We look forward to helping you! A+ Japanese Auto Repair has been a family owned and operated Lexus repair & service center since 1997. Our expertly trained Lexus auto repair & service mechanics are trained to help you with your Lexus service and repair for all Lexus models. And all of the others! What services do we perform on Lexus vehicles? When it comes to Lexus repair and service our facility does everything from engine oil and filter to changes to major engine & transmission overhauls/replacements. We perform the 5K services, minor service, major service, timing belt replacement, tires, alignment, water pump replacement, extended warranty work, brakes, belts, electrical, and diagnostic work! What makes A+ Japanese Auto Repair Inc. A specialized Lexus repair & service facility? Taking your vehicle to a Lexus specialist such as A+ Japanese Auto Repair can save you time and money. More importantly, it can provide you with peace of mind and keep the factory warranty on your Lexus vehicle in effect. If you have any questions regarding Lexus repair, service, or pricing feel free to stop by A+ Japanese Auto Repair Inc. in San Carlos for a consultation with one of our automotive Lexus service advisors. We look forward to working with and your vehicle. Independent repair shops specialize in a great many things. Some independent repair shops specialize in one area alone, such as transmission and drivetrain specialists, HVAC (heating, ventilation, & air conditioning), electronics & drivability, radiator and cooling systems, brakes, front end, tires, wheels, steering/suspension, and many other areas. So you may ask... why choose A+ Japanese Auto repair for your Lexus repair & service needs? No brainer: We are experts at everything Lexus. A+ Japanese Auto Repair Inc. has been recognized by our clients as the "Local Lexus repair & service experts in the San Carlos, CA area. A+ Japanese auto repair has the specialized Lexus repair tools, quality parts, and knowledge to provide an effective and accurate Lexus repair in the most efficient manner. Not only do we have the Lexus specific knowledge needed for any job we may need to perform on your vehicle, but we understand the idiosyncrasies of the Lexus automobile better than most other independent repair shops. Who will be working on my Lexus when I bring it into A+ Japanese Auto Repair Inc. in San Carlos, CA? Eric Sevim started A Plus Japanese Auto Repair in 2001 with his brother Adam. They have since increased the success of A+ Japanese Auto Repair, Inc. by continuing to maintain great relationships with our clients and by providing the best auto repair on the peninsula. Eric remains a strong leader in our community by actively participating, volunteering and donating to local events and programs. We call him Superman because he does everything! When he finally does take off all of those hats, he can be found skiing, bike riding, running, at a concert or with family and friends. PAUL THIND, MASTER MECHANIC - A+ JAPANESE AUTO REPAIR INC. Specializing In: ASE Certified Mechanic. Repair specialist trained in Toyota and Lexus drive trains. Paul is a highly skilled Master Mechanic. Paul has been with us since Mid 2012. During this time he has really showed us how skilled he is when it comes the service and repair of our clients vehicles. 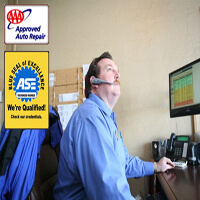 Paul is an expert when it comes to the repair of the following vehicles: Honda, Acura, Toyota, & Lexus. When Paul is not at work providing our clients with the highest quality car repair he is traveling California with his family enjoying the many sites and destinations our state has to offer. Paul looks forward to providing you with the highest level of car repair at your next service interval. A+ Japanese Auto Repair Inc. - Lexus Specialists - "Where friends recommend friends"